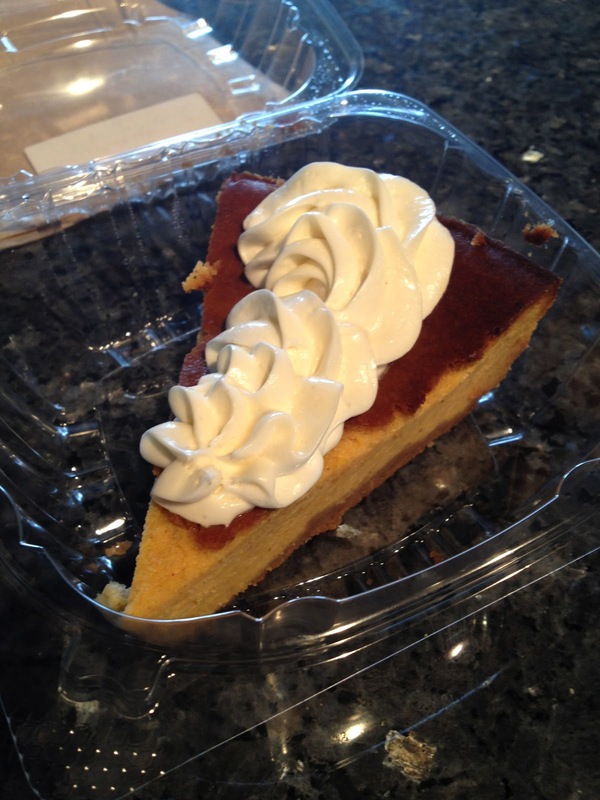 I believe this Pie Shop was voted for one of the best Sweet Potato Pies in the nation! And when you try a slice, you will realize why. It has incredible flavors that I would never have thought sweet potato pie could taste like. It is one of those pies that keeps calling your name... and sooner rather than later, you have eaten two or even three slices. And surprisingly, they make amazing food too! Their sweet potato theme is carried on among all their menu items and it definitely shines in some more than others. But whatever you order, you will not be disappointed. Easily the best pie option for Thanksgiving, or just any other day. Their sweet potato filling is super creamy and extremely rich. 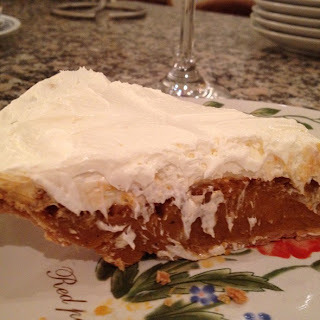 I never imagined sweet potato pie being the star of a Thanksgiving dinner... but this year it was! And then the Honey Cream Cheese topping was unreal! I could honestly have a pie just with this topping. The honey flavor is not too strong, but it is super sweet, just like the name implies! I love this pie! I crave slices of this bread! Jimmy Jamm's only makes a few loaves at a time and sometimes they run out of the bread, so whenever I stop by, I try to buy as much as they will let me. The bread is thick cut, moist, and has the perfect sweetness. It is a great vessel for a sandwich and holds up well against greasy meat or various condiments. I want to start by saying I absolutely loved this sandwich. This is their speciality sandwich which consists of thinly sliced steak put on the flat-top and sautéed with onions, green peppers, tomatoes, and cheddar cheese. All the vegetables weren't cooked to a mush, still giving the sandwich a nice textural crunch to it. The best part of the sandwich is definitely the bread. They make homemade sweet potato bread which is "TO DIE FOR." I honestly dream about the bread and buy slices to make my own sandwiches. Look above for a description of the sweet potato bread. All in all, this sandwich is grilled, nicely warmed, and full of different flavors! As you can see, two of my friends ordered this sandwich. They were impressed with the simplicity of the sandwich and also loved the sweet potato fries. The sandwich was served with lettuce, tomato, mustard and mayo. (I would stay away from the mayo because one of my friends didn't feel to well after eating mayo while the other choose not to have it.) The fries were freshly fried, crispy, and well seasoned. Everyone loved the contrast from the sweetness of the potato and the saltiness from the seasonings. I will be getting this sandwich next! The sweet potato ice cream is super refreshing especially during the past summer when 100 degree days were constant. They offer a free sample when you walk into their store so definitely try it out! It actually reminds me of a frozen pumpkin pie in more of a gelato consistency rather than ice cream. This was a very simple cupcake. The sweet potato flavor was baked right into the cupcake. 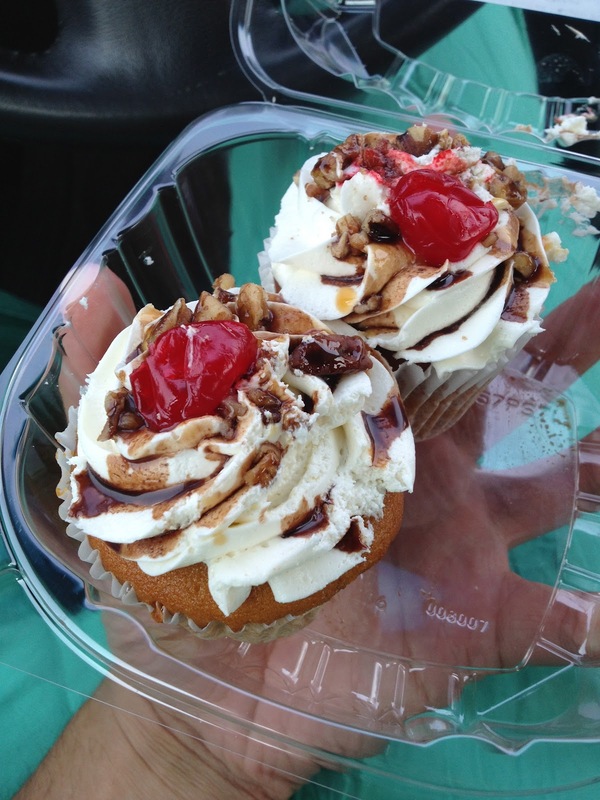 It was topped with their famous honey cream frosting and then drizzled with a little chocolate, sprinkled almonds, and a cherry. 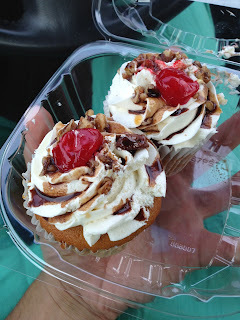 The cupcake was very rich and I definitely enjoyed having it for my dessert. I think everyone loves cheesecake and this is another type that you will love. Honestly, the cheesecake is very overpowering and the sweet potato doesn't really shine in this dessert but the cheesecake is still tasty and made fresh frequently. So it is a safe bet for sure. I was a little disappointed with this dessert but mainly because I didn't eat it right away and the crust hardened up on me. The cobbler is simple; it is just huge chunks of soft sweet potato cooked in some butter and cinnamon and topped with a thick crust. If I could change one this item, I would make the crust thinner and sprinkled brown sugar on top before baking. It would make it a little sweeter and more of a dessert in my opinion. - Do order some of their sandwiches! They are amazing and you will not be disappointed. - If you want a pie... ORDER AHEAD OF TIME... especially if it's around Thanksgiving! - Be ready for the best pie ever! They have multiple toppings so try and let me know! - Don't show up the day before Thanksgiving expecting them to have extra pies... They take orders for weeks and the waiting list is way too long!